Here f closure is a lambda function. A lambda function saved as closure as a value type, so each closure in a f is a new copy. So curry (a variable which hold the lambda function) get a function and all other arguments in a second closure, the stack object, and then return a lambda object. We make a new lambda named curried, which hold the anonymous function. The disp variable hold another lambda, which we use it with a Call (without returning a result). By default if we use a numeric type lambda we get 0 if no return statement exist in function (we use = as statement to return value(s)). In M2000 a call to a function or module done without checking for proper arguments at the calling part. We can analyze the input before the use of arguments in code, but most times we use a Read statement, or the syntactic sugar the parameter list in parenthesis (which make a Read statement). Calling a function by Call we place current stack among the arguments, but using a function in an expression we use new stack with arguments only (can be expand, but at the exit from function the stack deleted). Type checking are in two levels in M2000. First level, or basic level, is the two types, the numeric and the string type, for return type from expressions. So if we want a string type function we have to use $ in the name and for lambda functions we have to use lambda$ (and not lambda). A numeric type can return objects too. Also the string type may return objects too. Second level type checking is about the type of arguments. If we don;t provide type then type must be numeric/object or string/object depends of the name (like first level). In sum function we have a loop while stack is not empty and we get a number. If stack item isn't a number we get error. change these lines to pass enum type arguments. We use the peek function, stackitem() which return numeric value even we have object, but we have to drop manual, using drop statement, to emulate a pop from stack. Push 10 : Push "ok"
Stack ' show "ok" 10 20 1 2 "end"
Consume 3 ' show 3 "ok" 10 20 1 2 "end"
Stack ' show 1 2 "end"
When we call a user function in an expression, interpreter give a fresh new stack of values, so any value on stack at the exit of function just removed as stack destroyed. Stack pass values by value, and reference type by pointer (a reference is something else from a pointer). Reference type is an array, so if we push an array three time we push only three pointers. If we change the array after the push, then when we read the array we get the changed array. We can use Cons() function to make a copy of one or a copy of the merging of two or more arrays), and pass this new pointer as the array to stack, so only one pointer exist, and this only to stack. Also we use Set Fast ! and Set Fast, one for changing the way which interpreter control screen refresh, the "Extreme" Fast !, and the "Normal" Fast (there is also the Set Slow). We use Set to send the line of code to command line interpreter (global name space). We can use Fast !, Fast and Slow in M2000 console without Set statement. The example program (783 lines) get a string in stack of values using a Push statement, and a string in curly brackets (including line separator the two characters crlf) with a context of a program written in a simple language, (which draw a Mandelbrot ascii image), and pass it to lexical analyzer, then to syntax analyzer then to code generator and then to virtual machine. All in one program, with one module the CompilerExample. (M2000 identifiers are not case sensitive, ecxept for labels, for using with goto and gosub - the BASIC type statements). About scope in M2000. Each module and user function has own scope. A local variable always shadow a global one with the same name. We can use closures to lambda functions, passing them as copies. We can alter the value of a closure inside the lambda function. M2000 can use OOP but here not needed for this task. A subroutine is a code private to a module or and a function. In a subroutine we have the same scope as module or function, so we have to use Local to shadow any module's variable with same name, or when we call again (recursion, or mutual recursion happen). Subs have a limit of 10000 calls for private in module return stack, but we can change that to million calls, using the Recursion.Limit statement (or using Recursion.limit 0 for no limit until we get out of memory, including virtual memory), Modules and Functions have three number to indicate the recursion level, which are the three type of calls, in M2000, the simple call of a module using only the name (6354 calls, but no recursion allowed, so we have to use mutual recursion for global modules), the call using the Call statement for functions and modules (also stack of values are the same for each call, so we get about 5422 calls) and functions calls in expressions (we have new stack of values for every call, about 3233 calls). Arguments passed to stack of values when we call something, not to the return stack. When interpreter loaded to execute, check the length of stack, so we can get these values for calls, using Monitor statement from console. So interpreter has one return stack (size defined in M2000.exe), and for each execution object (modules and functions have execution objects) there is also a subroutine stack. Modules also have a pointer to parent stack of values, and functions (if called in expressions) hold own stack of values. Except return stack, all other stacks are kept in heap. We use some ready made objects, like Invetories (a type of vector), enum types, Buffer (memory block). Also we use Form ! 120, 60 (for TV to use safe area we use this !, but we can use Form 120, 60 without it for a monitor), which give us a console with 120 characters per line, for 60 lines. We want big width for characters in a line to use it for drawing with ascii. M2000 console works for graphics. Using Move 6000,6000 : Circle 3000 we make a circle of 3000 twips, with a center at 6000twips from left side, and 6000twips from upper side. 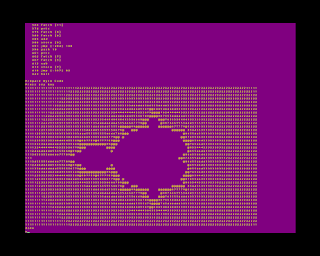 But for the task we use ascii drawing. We didn't use the Print ordinary statement, but a variant which is like to send unicode characters to a file, but we use #-2 to send it to console screen. The ordinary Print not process CR and LF from chars (the print as spaces), because we use @() to move the cursor to print. Also normal Print statement use columns, so Print #-2 bypass columns, and print to the next. Both Print and Print #-2 use the ; for not using a new line as the last action of statement. Inventory symbols=Op_multiply:="Multiply", Op_divide:="Divide", Op_mod:="Mod", Op_add:="Add"
Append  symbols, Op_negate:="Negate", Op_not:="Not", Op_less:="Less", Op_subtract:="Subtract"
Append  symbols, Op_lessequal:="LessEqual", Op_greater:="Greater", Op_greaterequal:="GreaterEqual"
Append  symbols, Op_equal:="Equal", Op_notequal:="NotEqual",  Op_and:="And", Op_or:="Or"
\\ there is one type more the Invetory Queue which get same keys. \\ But here not used. \\ We set string as key. key maybe an empty string, a string or a number. \\ so we want eash string to saved one time only. Global pc\\ functions have own scope, so we make it global, for this module, and childs. If not stack.size=1 Then Flush : Error "Ast not loaded"
\\ all lines of assembly goes to stack. Maybe not in right order. \\ we use an iterator object, str^ is the counter, readonly, but Eval$() use it from object. \\ subs have 10000 limit for recursion but can be extended to 1000000 or more. \\ function to extract string, replacing escape codes. \\ dim or redim buffer append 1000 long as is. Δεν αναφέρεται το 2000 στη χρονιά αλλά στην χιλιετία. Αποτελεί περιβάλλον προγραμματισμού και συνάμα περιλαμβάνει τον διερμηνευτή. Θέμα Απλό. Εικόνες θέματος από Naseko. Από το Blogger.